This 54 year old man died of a septicaemia secondary to acute prostatitis, while recovering from pneumococcal meningitis. He had been a heavy drinker for 10 - 15 years. 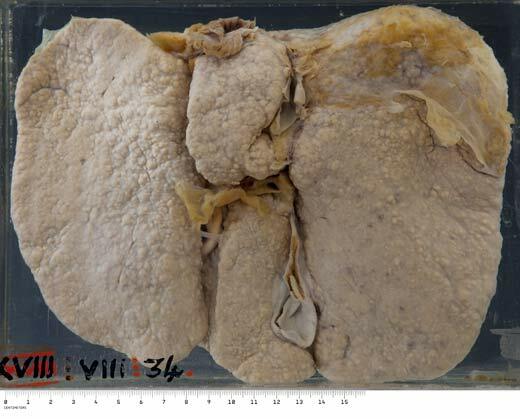 During the septicaemic phase of his illness he went into liver failure, and the reason is evident from this specimen. A cirrhosis is present, largely micronodular, although it appears as though there is transition occurring to macronodular. Note the yellow colour of the liver due to fatty change. 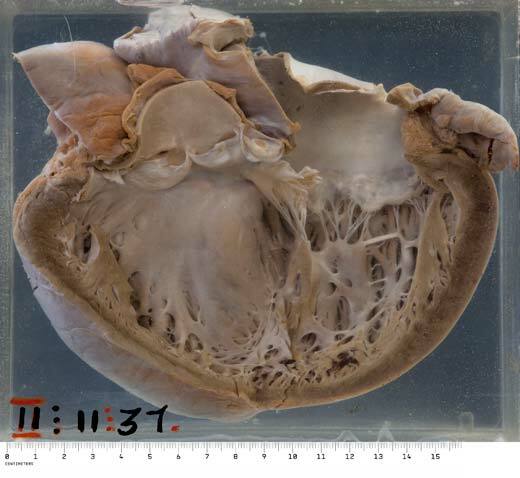 The heart is that of a 43 year old alcoholic man who had been under consideration for heart transplantation for alcoholic cardiomyopathy, but died while awaiting surgery. The heart (mass 505g, normal ±300g) is enlarged and flabby due to generalised hypertrophy and dilatation. 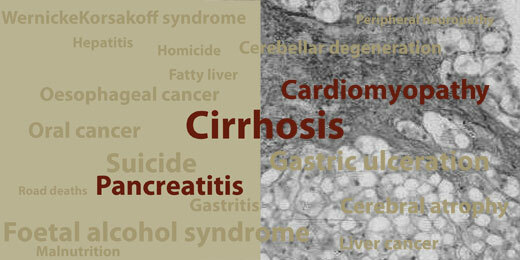 Heavy, long-term alcohol use (at least 80g per day for more than five years) is required to produce cardiomyopathy. Alcohol is considered to be the cause of up to 40% of cases of dilated cardiomyopathy, though alcoholic cardiomyopathy cannot be distinguished morphologically from dilated cardiomyopathy of other aetiologies. The disease is characterised by progressive cardiac dilatation and contractile dysfunction, and patients present with symptoms and signs of heart failure. Fifty percent of patients die within two years. It is believed that the alcohol metabolite acetaldehyde is responsible for the cardiac injury, though a combination of additional factors such as beverage additives, nutritional deficiency (thiamine, zinc), smoking and hypertension may all play a part. Note the markedly enlarged pancreas due largely to oedema. Scattered throughout the substance are areas of necrosis and haemorrhage, and there are also present multiple opaque white areas of fat necrosis. The adjacent pancreatic fat is also oedematous and shows sharply outlined areas of fat necrosis. The pathologic changes seen in acute pancreatitis are largely the result of autodigestion, due to the escape and activation of pancreatic enzymes such as lipase, elastase, trypsin and amylase. Alcohol may precipitate acute pancreatitis via a number of effects such as direct toxicity for acinar cells, oxidative stress leading to the release of free radicals with membrane damage, increased exocrine secretions and spasm of the sphincter of Oddi. In severe cases of acute pancreatitis, the explosive systemic inflammatory response results in peripheral vascular collapse, shock, disseminated intravascular coagulation, adult respiratory distress syndrome and ultimately multi-organ failure.